The Hawks are still better than Winnepeg. Nashville will go as Rinne goes (which isnt what it was 2 years ago). Minnesota is still more than beatable. Varlamov should come back to earth. 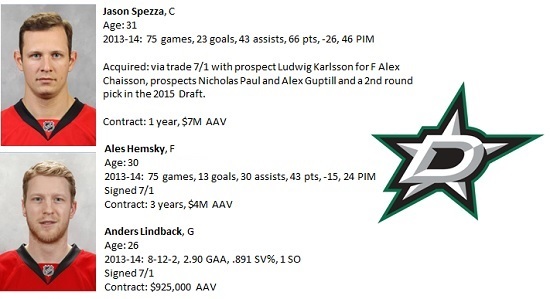 I did like Dallas’ move to get Spezza and Lindback is a decent enough back up for Lethonen. The Blues will be the biggest issue with Stastny now in tow… but they couldn’t win with Miller so why would I think they are world beaters with Elliot and Allen. We ARE the team to beat. Period. Tim G – Agree we are still the team to beat. The cap issue concerns me unless we can move Oduya and or Sharp. If we cleared Sharp’s salary we could possibly pick up Penner or Setoguchi on 1 year deals to fill the 3rd line LW spot. Both are probably signable for 1yr at a reasonable amount. Anybody else still available that could help us if we can open some cap space? I don’t see the Hawks moving Leddy this year, so its time to move Oduya while we can get something in return. I think the Blues are the team that helped themselves the most. Stastny will be a big help and Gunnarsson is an upgrade over Polak but I think Lehtera could be the biggest surprise if he adapts well to the smaller ice. The Blues gained without having to lose much. The Stars are the other team that could take a step up. Spezza is the real deal and Hemsky is good if he can stay on the ice but they had to give up Chiasson who was one of their good young energy players. The Wild swapped Moulson for Vanek so a bit of an upgrade and Sutter is a good complementary player, but I think the biggest gain for them will be their young players getting better – Granlund, Haula, Coyle and others. I still like the Hawks to beat any of them in the playoffs though. No thanks on Penner or Setoguchi Mike. Those two haven’t really produced anything more than what you get from Versteeg, Smith, Kruger, Bickell; and I have full confidence that Morin can match those numbers as well. No, if you trade Sharp for some reason, the replacement for 14-15 would be Kevin Hayes. 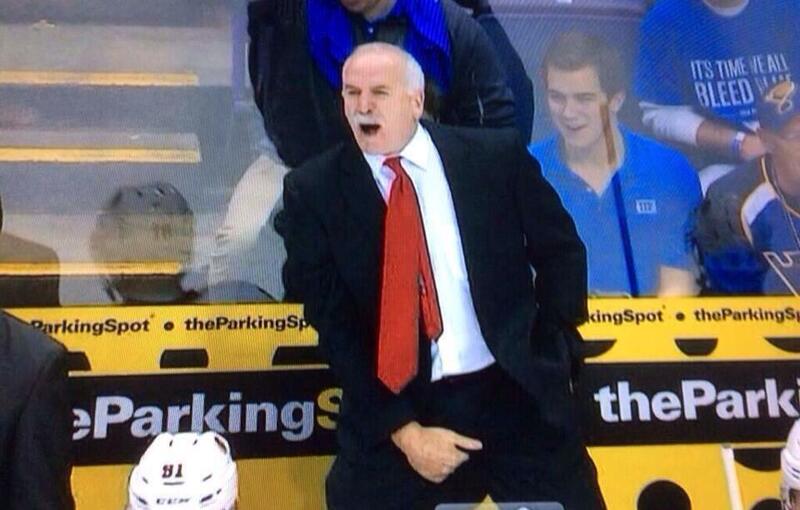 I will be more concerned with the Wild when they get a new coach or Yeo changes the style of play for the team. That is a burnout style they have now and while it has produced results for them, it cannot be fun to play in. Additionally, what the Wild are doing to Suter is borderline irresponsible for the investment they have in him. His ice time lead the league for the regular season at 29:24 and he played the full 82 games. This ice time was 2 minutes more than the next player. His ice time actually came down to 29:13 during the playoffs over 13 games. The one plus to a guy like Penner or Setoguchi over Versteeg would be size (and significally in Penner’s case). 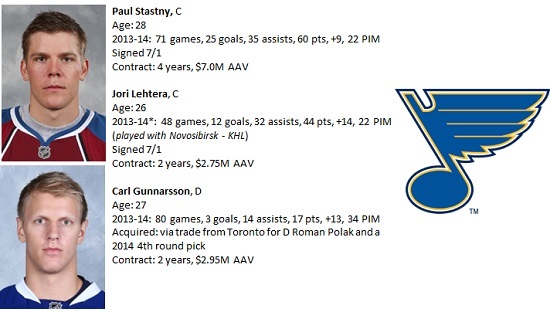 While I think think both are good 3rd/4th line additions… the short answer is that it wont happen. The offensive production would be about equal. But only makes sense to add them you can move Versteeg or like you said if Sharp got moved. Versteeg, as of right now, would be a hard to move piece cuz someone trying to add Versteeg could just a easily sign Setoguchi for the 2.2 they would be paying Steeger. Versteeg would probably get moved in a package with Oduya/Leddy (but ill leave which as a debate that has already been had). More so, if a forward does get moved (Versteeg or anyone else for that matter), they probably just let TT get first crack at roster spot before they add someone. StL certainly improved the most. The Jets may be your sleeper as that young team matures. A lot depends on E Kane. Minny, basically a wash unless Minny changes their philosophy. Dallas, great additions but still a few players away from deep post season run. The Preds, a wash. Colorado has actually gone the wrong way. Got older and slower. Stuart was decent move for their blueline. Hawks got better through attrition. Richards for Handzus and Morin for Bolig = pretty big upgrades. Sharp, as Tab has repeatedly stated, is our leading goal scorer and not going to be traded, at least not as a salary dump. I am inclined to believe that the cap reduction will come from the defense. Hawks simply have to many Dmen on roster and waiting. SB believes he has a diamond in the rough with Rundblad and picked up Cumiskey so someone in Rockford is coming this fall. Hawks do NOT need anymore roster players. Therefore whoever is traded will be for prospects and picks. Sharp is probably not the guy. I agree that Sharpie will be here for 14/15; beyond that is the question. He’s been a great Blackhawk but, unfortunately, he’s likely to be on the move at some point down the road. We can’t keep everyone and an infusion of new blood to a certain degree can’t be a bad thing in the long run. Penner, I don’t see it at all; of the two Setoguchi for the bottom 6 if either. Also agree on the points that any significant moves will be backliners. This is the year that some of the kids that have been so talked about will have to come to the forefront; we’ll see who and how they develop which will foretell how 15/16 and beyond will be addressed. Can’t wait for the puck to drop. We’re in great shape. We were in great shape before acquiring Richards. We’re the team to beat. I love our lineup, and I don’t buy the argument that “it needs more toughness.” Ken Hitchcock said it best during the series last year, paraphrasing: “The Blackhawks don’t get intimidated. They just skate through the hits.” He’s spot-on. We do not give a $hit how physical other teams are. We put the puck in the net, and we will take a beating to do it. That’s one of the reasons it’s particularly important for us to roll 4 lines: it minimises the physical toll of that style on each individual player. Very happy with our roster and how it suits our style of play. Tough division, but we’re the deepest. The fact the 19/88 contract extensions didn’t get done on July 1st would suggest a higher rather than lower number, assuming they get matching contracts. If it’s maximum term (8 years for home team), then what will seem high now will smooth out over the next 8 years and will probably seem the inverse by the end of the deal. The higher the amount now only means the longer it will take to replenish the depth after the purge next summer – but it doesn’t mean the end of the Hawks resurgent era. The 2015/16 and 2016/17 seasons may be like the years following the 2010 win, but then came 2013. So while it would be better for the short term success of the team if the wonder twins signed for $8.5M, the good news is that the Hawks will still have 19/88 to build the team around and that’s the bottom line. I won’t be shocked if Toews and Kane come in at $11 mil per season or so. What some of you conveniently forget is the very nasty labor lockout of 2012 and early 2013 that very nearly cost a season. A bitter labor fight that saw Toews as one of the leading and most vocal voices of the NHLPA. Even in the best of circumstances ask yourself why 19 and 88 would leave big money on the table. They aren’t going to give a deep discount to the Hawks. Not when they each could command $12 mil per on the open market. Also, it does factor into things that 19 and 88 have already basked in the glow of 2 Stanley Cup championships. Next offseason there will definitely be some deep reductions to this roster. Very real chance we are staring at the last season of Sharp and Seabrook in Chicago. Which I will be fine with because both are in likely decline mode at this point. The wildcard is going to be finding the money for Saad. Always entertaining to read thoughts on the 88/19 $$ situation, particularly in blogs, mainstream media and related reader comments/feedback. There is typically such a player/labor tilt in these forums it’s an interesting social phenomenon. I guess most people in this context continue to blame the owners for the lockout and look at the players as victims of the big, bad, greedy corporate world. Please. Like it or not, it was strategically and fiscally necessary to establish a cap. The result is the league is financially healthier than ever (both sides of the coin), salaries are on the rise and the popularity of the game is gaining traction in the media. I could care less if Toews was a vocal participant in the “bitter” negotiation process and it should have no bearing on his contract negotiations. Bottom line, IMO, the Hawks would be foolish to pay these guys over $10M/yr (which sounds about right), and 19/88 would be foolish to walk away from such precedent setting numbers and their oppty to succeed together with the Blackhawks organization. Maybe 19 and 88 think $11mm IS a hometown discount. Last thing I will say is the $10mm a year in Chicago is worth more than $18mm per year in Winnipeg. (exchange rate, taxes and endorsements)……………..if money is the driving force. 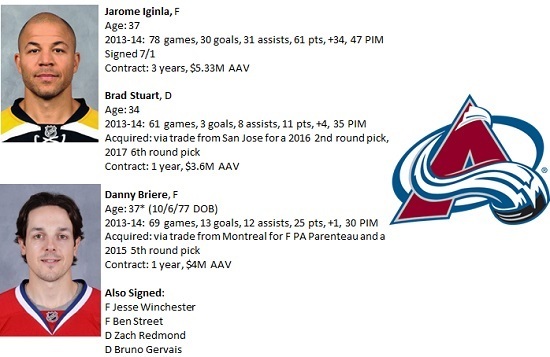 The AVS spend over 9 million on Iggy and Briere,….that’s awful!